Yesterday had a great tour at Neot Hakikar with Javier et al. (Spain) and Werner (Switzerland). We began with nice views of displaying male Dead-Sea Sparrows and already hundreds of Pallid Swifts. After dusk we saw four Nubian Nightjars - it was an exceptionally warm evening, with strong insect activity which resulted in very good nightjar activity. 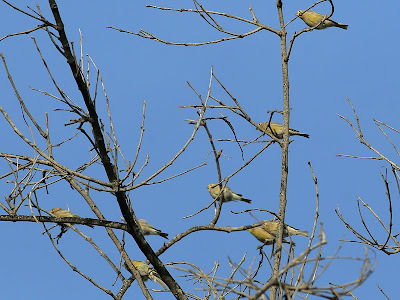 Today tried to catch Syrian Serins gathering to roost in Midreshet Ben Gurion (Sde Boker). About 40 birds came in to the pre-roost on some big trees. The wind was very strong this afternoon so the catch was pretty bad - only two birds got caught, but two birds are much more than nothing. 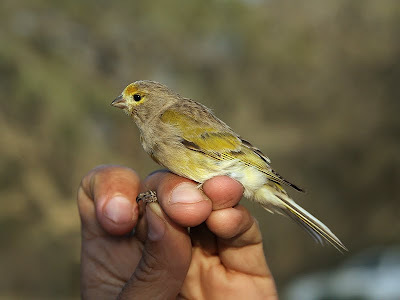 It was very interesting for me to handle these birds in winter. We catch hundreds every summer on Mt. Hermon, so it's cool to see them in their fresh post-moult winter plumage. Thanks to all the guys who helped - Elon, Darren, Eyal, Itzik and Shemesh. Hi Yoav, nice blog you have ! I'd like to have your view on this putative Heuglin's Gull second summer; see pictures here. Finally, would you like to contribute to this site by uploading some of your pictures of ringed gulls ? Many thanks, Menotti Passarella, Italy. Hi Yoav, many thanks for your comment to the putative italian Heuglin's Gull ! Have a nice week-end.